Most of you have probably decided on a menu for Thanksgiving 2012. There’s always next year though, and perhaps that may be where this blog comes in. Here are a few ideas that may whet your appetite in the meantime. Combine first three ingredients in a saucepan over medium-low heat, but do not bring to a boil. When butter has melted, stir in flour all at once. Stir until dough coheres into a smooth paste, then transfer to a mixing bowl. Mix into the choux paste, then drop by the spoonful or scoop choux paste into a pastry bag and pipe onto a greased cookie sheet (or parchment paper-lined cookie sheet), and bake for 10 minutes at 375 F, then 15 minutes at 350 F.
Break one or two eggs into a small bowl. Season to taste with sea salt and freshly milled black pepper, then beat lightly with a fork. In a large skillet, melt 1 tablespoon unsalted butter over medium heat. When the butter has nearly finished foaming, add the eggs to the pan. Let the eggs cook undisturbed, about 1 minute, or until it sets. You may have to tilt the pan slightly so that the eggs flow out over the pan. Cook the scrambled eggs until they’re just a little looser than you like them. The eggs will continue cooking for a bit longer when you remove the pan from heat. Slice off the tops of the gougères with a sharp knife. Spoon some scrambled eggs onto the base of each gougère, then add a few capers. Top with the gougère half and serve at once. You have to work quickly when you get to this stage, because if you wait too long, the gougères will collapse and lose their puffiness. 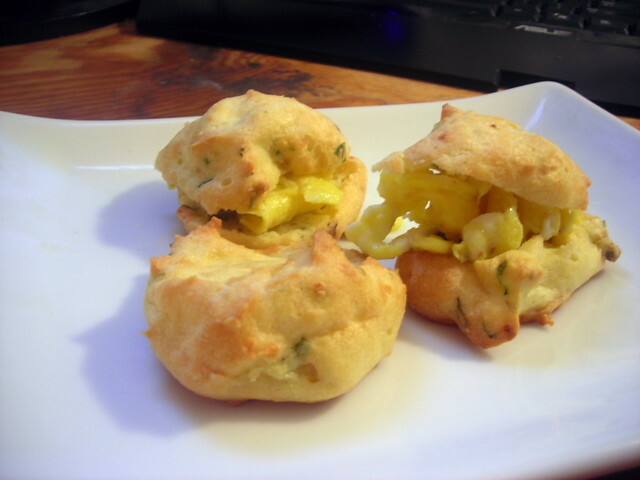 Note: This is a slightly tweaked version of Alice Waters‘ recipe for gougères in ‘The Art of Simple Food‘. This recipe is a lesson in timing. Once I popped the cookie sheet in the oven, I had 25 minutes to make the eggs. And naturally, the stupid fire alarm went off at the most inopportune time. I had forgotten that my oven tends to get hotter than most ovens. Alice’s recipe calls for baking in a 400 F oven, so the temps in my version of her recipe have been adjusted accordingly. This appears regularly on Babbo’s and Otto’s menus (which you may know as restaurants owned by Mario Batali). 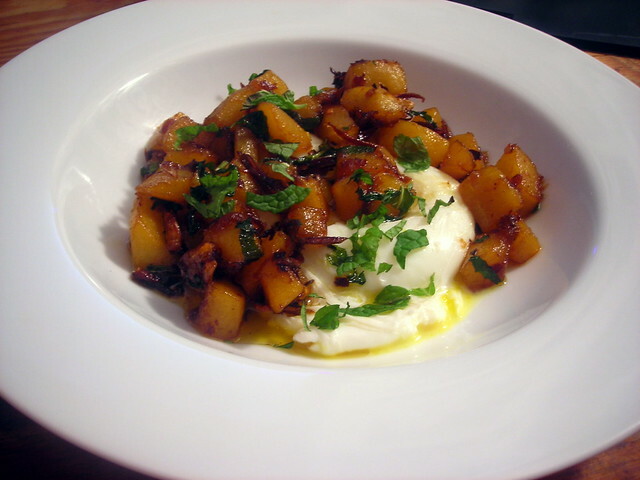 The poached egg is my own addition. You can view Mario’s recipe here. If you omit the egg, it becomes vegan. 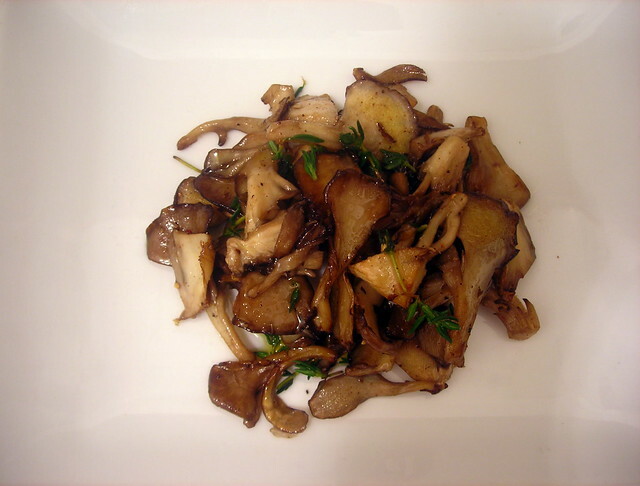 The recipe for the mushrooms pictured above can be viewed here, but note that my version contains no butter. Same procedure as the linked recipe however. 21 Nov	This entry was published on November 21, 2012 at 4:18 am. It’s filed under autumn, food, food photography, French food, Gluten-Free, Italian food, vegan, vegetarian and tagged appetizer, autumn, food photography, gluten-free, mushrooms, pumpkin, Thanksgiving, vegan, vegetarian. Bookmark the permalink. Follow any comments here with the RSS feed for this post. this all looks better than the bland Midwestern thanksgiving fodder I grew up eating, where ‘exotic’ was green bean casserole.